She has thousands and thousands of sakhis (associate maidservants). The whole world worships her. She is the sanctifier of the whole world. She is the essence of all flowers. She gives happiness to everyone. She has an incomparable form. She is the life and soul of Lord Krsna. “O Tulasi, beloved of Krsna, I bow before you again and again. My desire is to obtain the service of Sri Sri Radha-Krsna. “Whoever takes shelter of you has his wishes fulfilled. Bestowing your mercy on him, you make him a resident of Vrndavana. “My desire is that you will also grant me a residence in the pleasure groves of Sri Vrndavana-dhama. Thus, within my vision I will always behold the beautiful pastimes of Radha and Krsna. Although we can never fully describe the glories of Tulasi Devi, an eternal associate of Lord Krsna, the scriptures give us a hint of the value of worshiping her. The following list comes from the Padma Purana. — Tulasi is the essence of all devotional activities. — The leaves, flowers, roots, bark, branches, trunk, and shade of Tulasi Devi are all spiritual. — One who with devotion applies the paste of Tulasi wood to the Deity of Krsna will always live close to Krsna. — One who puts mud from the base of the Tulasi tree on his body and worships the Deity of Lord Krsna gets the results of one hundred days’ worship each day. — One who offers a Tulasi manjari to Lord Krsna gets the benefit of offering all other varieties of flowers, and he goes to the abode of Krsna. — One who sees or comes near a house or garden where the Tulasi plant is present gets rid of all his sinful reactions, including that of killing a brahmana. 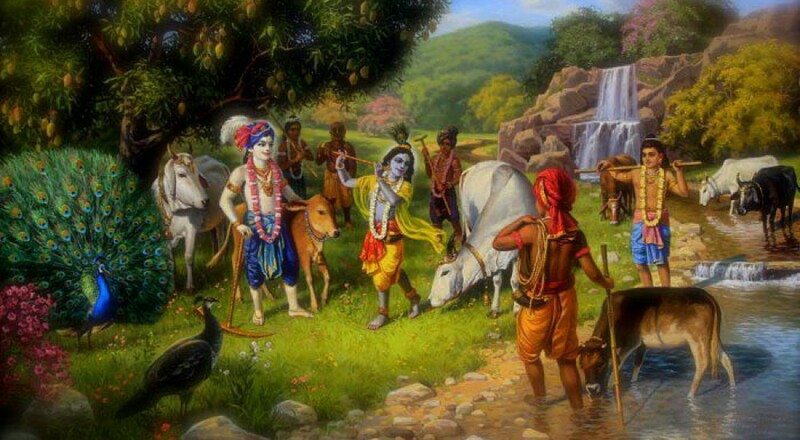 — Lord Krsna happily lives in the house, town, or forest where Tulasi Devi is present. — A house where Tulasi Devi is present never falls on bad times, and it becomes purer than all holy places. — The fragrance of Tulasi Devi purifies all who smell it. — Lord Krsna and all the demigods live in a house where mud from the base of the Tulasi tree is found. — Without Tulasi leaves, Lord Krsna does not like to accept flowers, food, or sandalwood paste. — One who worships Lord Krsna daily with Tulasi leaves attains the results of all kinds of austerity, charity, and sacrifice. In fact, he has no other duties to perform, and he has realized the essence of the scriptures. — One who puts into his mouth or on his head Tulasi leaves that have been offered to Lord Krsna attains Lord Krsna’s abode. — In Kali-yuga, one who worships, remembers, plants, keeps, or performs kirtana before Tulasi burns up all sinful reactions and quickly attains Lord Krsna’s abode. — One who worships Lord Krsna with Tulasi leaves releases all his ancestors from the realm of birth and death. — One who remembers the glories of Tulasi or tells others about them will never take birth again. I was born in the darkest ignorance, and my spiritual master opened my eyes with the torch of knowledge. I offer my respectful obeisances unto him. When will Srila Rupa Gosvami Prabhupada, who has established within this material world the mission to fulfill the desire of Lord Caitanya, give me shelter under his lotus feet? I offer my respectful obeisances unto the lotus feet of my spiritual master and unto the feet of all Vaisnavas. I offer my respectful obeisances unto the lotus feet of Srila Rupa Gosvami along with his elder brother Sanatana Gosvami, as well as Raghunatha Dasa and Raghunatha Bhatta, Gopala Bhatta, and Srila Jiva Gosvami. I offer my respectful obeisances to Lord Krsna Caitanya and Lord Nityananda along with Advaita Acarya, Gadadhara, Srivasa, and other associates. I offer my respectful obeisances to Srimati Radharani and Sri Krsna along with Their associates Sri Lalita and Visakha. krsna-varnam — repeating the syllables krs-na; tvisa-with a luster; akrsnam — not black (golden); sa-anga — along with associates; upa-anga — servitors; astra — weapons; parsadam — confidential companions; yajnaih — by sacrifice; sankirtana-prayaih — consisting chiefly of congregational chanting; yajanti — they worship; hi — certainly; su-medhasah — intelligent persons. In the age of Kali, intelligent persons perform congregational chanting to worship the incarnation of Godhead who constantly sings the names of Krsna. Although His complexion is not blackish, He is Krsna Himself. He is accompanied by His associates, servants, weapons and confidential companions. Whatever our career or varna, whatever our phase in life or asrama; we should do everything as a nice offering to the Supreme God. Whether nonprofit, for-profit, or charity; whatever we do, we should do nicely as an offering to God. Let me know if you know someone who would like to participate in an international Bhakti Yoga Vegetarian Club. We want to reach every neighborhood and every home with spiritual upliftment. Please keep me informed how I can do more to serve Krsna Katha round the clock. God would prefer heaven on earth working through and with all humanity. We have the essential goals of improving our eternal relationship with God and minimizing hellishness worldwide. We want saintly goals and saintly means to achieving those goals.